I have 4 groups of mice with 9 mice per group. Ive extracted RNA using Qiagen kit for mRNA extraction including miR (including DNase treatment). Checked all my samples on nanodrop, and quite a few had an extra peak. So I cleaned them up with 5M Sodiium acetate method. Finally beautiful looking samples when I nano dropped them. To make sure I m really using the 400ng for my RT , I double measured all my RNA samples with Qubit assay (Invitrogen). Did RT with promega kit, random hexamers. I made std curve by pooling 20 samples and then 1/3 serial dilution. All the time using RNAase free water. And I also diluted my samples 1:50 and 1:20 (falls into my std curve). (PS I ve run 2 of the samples on RNA seq so I m now in the process of validating the results by qpcr, already done PCR and seen that the primers work). 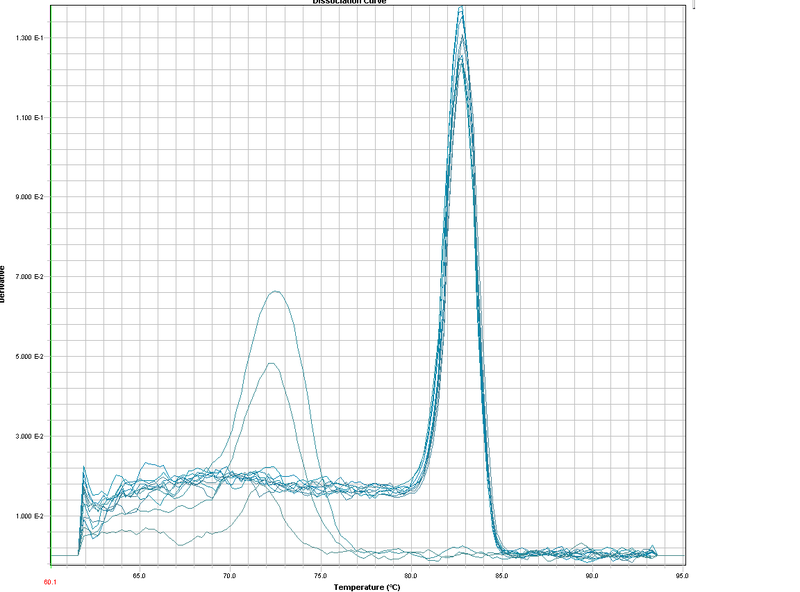 I ve run 5 different housekeeping genes (2 were ABI probes and 3 were sybergreener) on the std:s and the curves come up nicely. So I went ahead with my samples. My triplicates are very nice both for the housekeeping and gene of interest. But I get five different patterns on the same samples /dilution dependent on my housekeeping. QUESTION 1, what is the right pattern, what to trust? Then I looked back at my housekeeping and found that the ct values are sometimes 5ct values difference between samples while my gene has only 1-2 ct difference. And that on a GAPDH probe. I looked at the others and same problem there. Can I really have 5 different housekeeping genes , all regulated somehow? What shall I do? Because my boss is stressing me out wanting results, I have just continued hoping it was just for that gene. So I ran my stds on all 18 genes of interest (10 syber and 8 probes) and IT ALL LOOKS HORRIBLE. I have primer dimers i my sybergreener, some are present only in the lower dilutions, and some in the higher dilutions of the std curve. How do I solve that? My Tm is around 68 and I am acquiring at 60c. First, you have problems with stable housekeepings, you have to search the literature for housekeepings used in experiments silmilar to yours to pick out those that should be stable (GAPDH even when used widely is not stable at all conditions, like hypoxia experiments, in fact many housekeeping may be involved in the same pathways) and use geNorm or ...(what was the other?) to select the most stable one(s) in your setting. You may try ribosomal proteins and so on. For miRs you usually need miR reference, there are some published. You seem to dilute your samples pretty much, but that's dependent on the abundance and RT. If you get Ct between 15-30 it's probably OK.
As for the dimers, you need to optimise the reaction, increase temperature, change Mg. Do you get dimers together with your product or sometimes only in negative samples (including NTC)? I am not really sure, what went wrong in my primer efficiency tests, but I am assuming that I got primer dimers (small shoulder??). But additionally to this problem, I have peaks in my no template controls. What can this be? I loaded a gel and I could not see any bands in my NTC-lanes, pointing to any unspecific amplification / contamination. I'm using SYBR green to detect various genes (using total RNA), housekeeping (GAPDH) seems to give good results but the problem is the other few genes they keep giving me funny results, i.e. slope > -2.0 though I managed to get R^2 ~ 0.95. After some readings I figured out I should've done the melting curve first to detect primer-dimers formation, so I did. Attached example here is the melting curve for one gene. Due to the funny results after few attempts previously, I chucked the primer and use the new stock for this run. 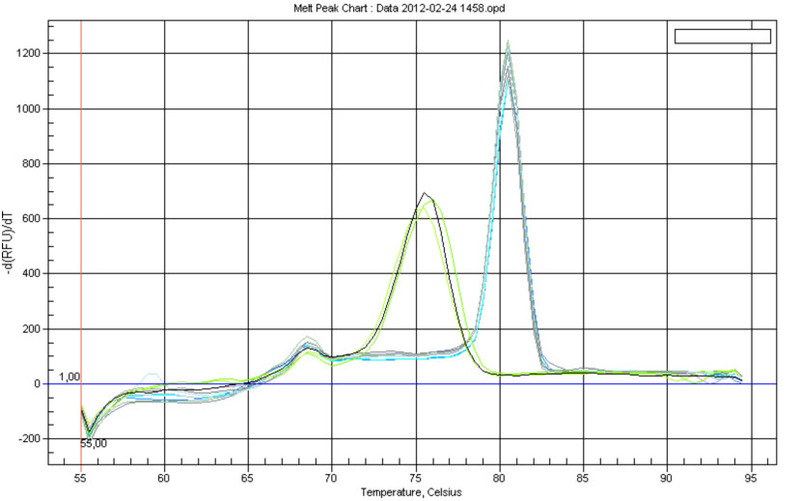 The samples mostly give Tm~82.5degC, but all standards have lower Tm ~72.5degC. I supposed the lower-Tm amplicons are primer-dimers, but how come the samples do amplify correctly, but none of the standards? What could be the reasons for this, and how do I improve my qPCR? What are your "standards"? They didn't look right, the peaks are wide and short. Can you please help me in qRT-PCR. I am also using SYBR GReen, but I am not able to see the melting curve like yours. Though in my normal RT-PCR I am able to see just one band, which is of my gene of interest. I tried to use different dilutions of cDNA like 1:10, 1:100 to figure out, but it didn't work. Then I made different dilution of SYBR green 50X, 5X, 3X, 2X, 1X, .1X, .5X, .01X, .05X but not able to see result. 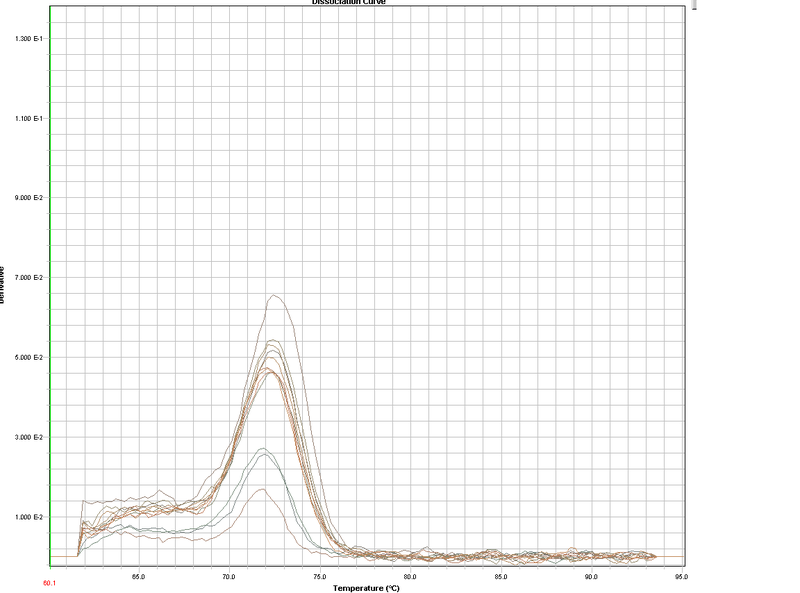 However, when I ran the product of qRT PCR into gel I was able to see just one band, which was of the size I required.